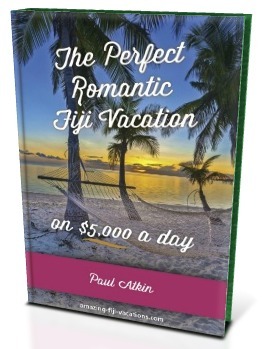 Fiji Romance Guide - A couples fiji romantic guide for $5,000 a day! Are you a couple going to Fiji on a budget? Discover how to have the perfect romantic getaway in Fiji on $5,000 a day, by using this romantic Fiji vacation guide. This Fiji romance guide has the best of the best resorts in all of Fiji. If you want absolute luxury in absolute seclusion with world class service and amenities, then this is it. Welcome to where the rich and famous come to relax! There are 4 stunning options, and each has a step-by-step cost breakdown for your entire stay in Fiji. The Ultimate Getaway Edition - "Perfect Romantic Fiji Vacation... on $5,000 a day!" A 28-page special e-guide taking you step by step showcasing 4 stunning resorts & packages for a budget of $5,000 a day. This "The Perfect Romantic Fiji Vacation, on $5,000 a day!" e-guide belongs to "The Romantic E-guide" series which has guides for budgets ranging from $250 to $5,000 a day per couple. Visit our hub Fiji Vacation Guides page to check the others out.